Hi Everyone! 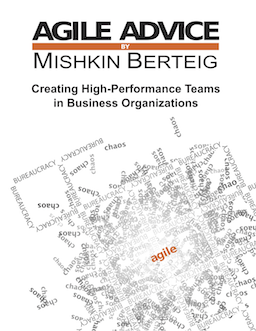 I’m writing a compilation book of the best articles of Agile Advice (as well as some that may not have been so popular, but which I think are important). I was wondering what you all think are the best articles from our archives so that I can be sure to include them! The best way to vote, since there are soooo many articles about Agile, Scrum, OpenAgile, Management, Org Change etc. etc. is to simply write a comment on the articles you think are the best and worth including in a book! You can comment on any of the articles: feel free to brows through the archives, go by subject, do searches, etc. As well, if you have any suggestions for specific blog posts that you always wish I had written, please comment in the section below. I will be including three brand new articles in the book that won’t be published here as stand-alone articles. If there are enough interesting suggestions for articles in the comments here, I will also choose up to three ideas to write about for special inclusion in the book and if you made the suggestion, I will including a credit to you for the question (if you want me to, otherwise you are free to remain anonymous). I’m hoping to get the first draft of the book out by the end of January since I’ve already put a lot of work into it, and that draft will be available for free here online for a limited time. The final draft will be self-published and I will provide links here to those who want to purchase it. Thanks for your loyal readership and thanks in advance for your votes and suggestions!